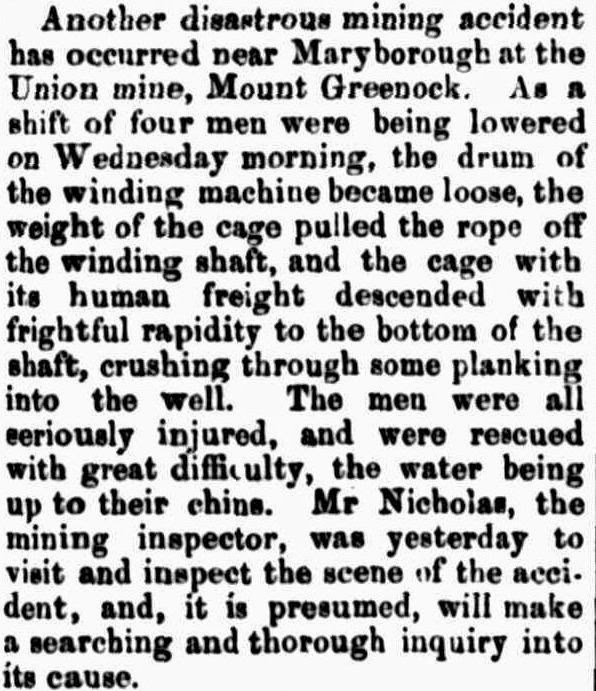 On 2 January 1884, there was an accident at the Union Gold Mining Company’s mine at Mount Greenock, 5km south of Talbot, in central Victoria. 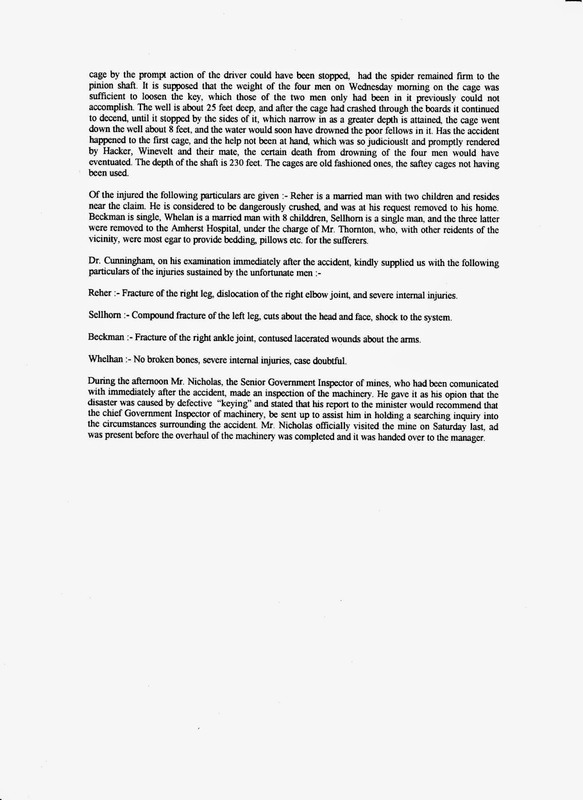 The accident happened when four men were being lowered to the working level of the mine at the beginning of their shift. The cage carrying miners to the working level was lifted and lowered by a steam engine which turned a horizontal shaft called a ‘pinion-shaft’. Attached to the pinion-shaft was a large spool of wire rope (this reel was called the ‘spider’) which, winding and unwinding, raised and lowered the cage. The accident was caused by poorly-designed and insufficiently strong keying (joins) between the spider and the pinion-shaft. The keys gave way and the spider spun out of control on the shaft. The spool of wire rope supporting the cage ran out of control, and the cage fell the last eighty feet of a 230 foot shaft. The cage was not a safety cage, although safety cages had been the subject of a Parliamentary Report five years earlier. One of the injured men was John Reher (1837-1891), the husband of Alice Young (1859-1935), my husband’s great grand aunt. Syndicated newspaper reports, such as the one that appeared in the Australian Town and Country Journal of 5 January 1884, reported that Reher was “the most severely hurt. His internal injuries are considered certain to prove fatal”. It went on to say, incorrectly, that Reher, “who was too badly hurt to be moved, is a single man”. Alice Young and John Reher had married in 1880. They had two children, Gertrude Alice Carol Reher born 1881 and Percy Powell Albury Reher born 1882. A third child, Elfleda Cecilia Anna Reher, was born in 1884, the year of the accident. 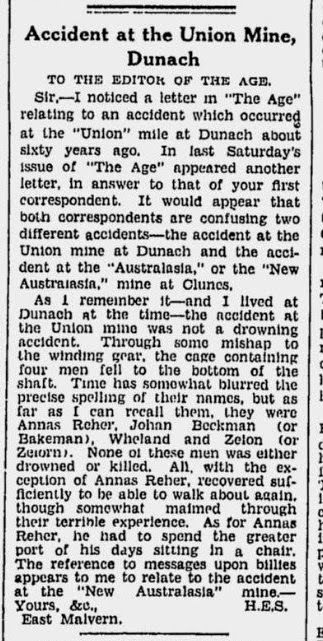 John Reher, and the three other injured men, survived. Morris Whelan was also married and had eight children, John Beckman was married with one child and John Sellborn was single. All four men were compensated with part wages paid for three months. The newspaper reports were not completely accurate about the names of the men and other details. For example, John Selborn’s name was reported as Selthorne. 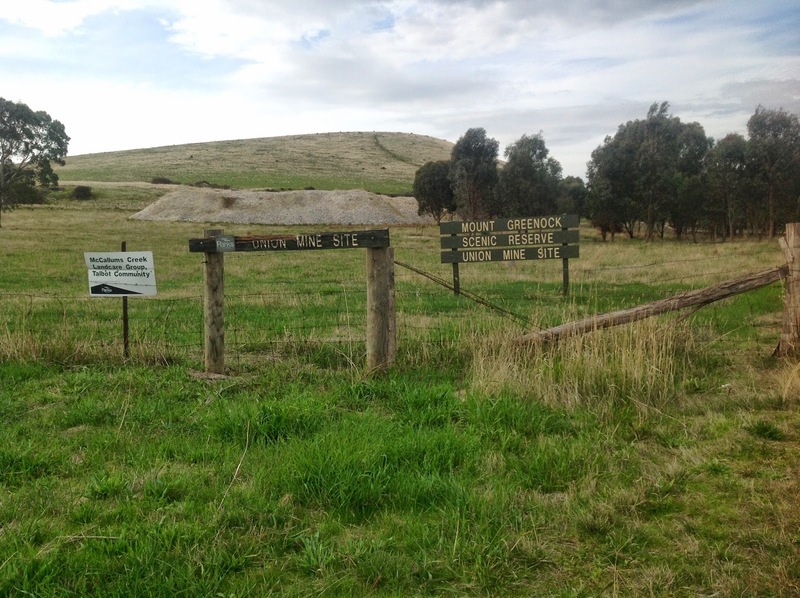 The names of the four men are recorded in the Victorian Mining Accident Index compiled by Dave Evans at http://www.ballaratgenealogy.org.au/resources/victorian-mining-accident-index . 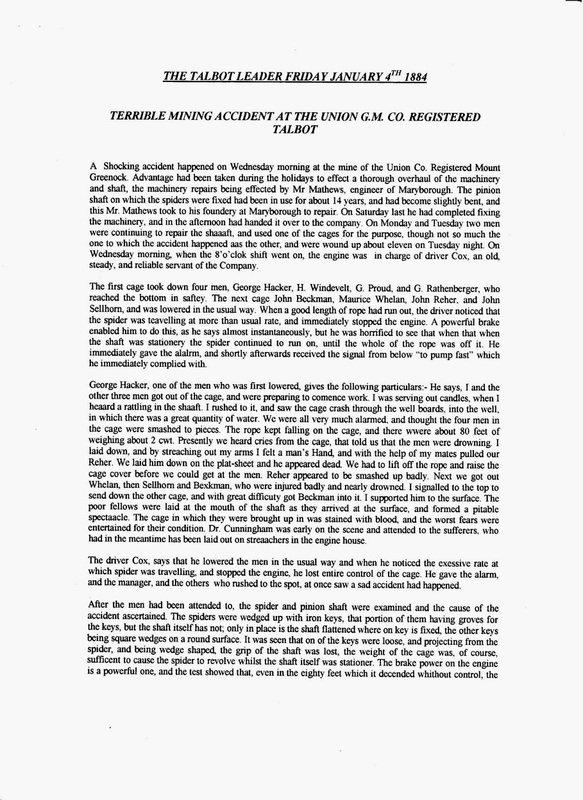 The on-line index has information of about 5,600 miners killed or injured from the early 1850s to the 1940s. There is also a more comprehensive index available on CD-ROM with about 9,100 names and more details. Nearly sixty years later the accident was remembered by a letter writer to the Age who recalled that Reher had to spend the greater part of his days sitting in a chair. John and Alice had a fourth child, Mary Maude Mabel Reher, born in 1886. John Reher died in 1891, seven years after the accident.